Sindabad.com, Bangladesh’s first B2B e-commerce venture, has clinched merit award in ‘Start-up Category’ at Asia Pacific ICT Alliance (APICTA) Award held at Guangzhou in China on Saturday, said a press release. 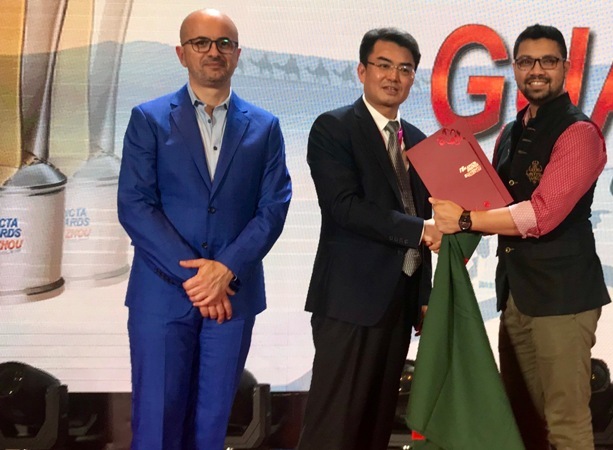 Sindabad.com co-founder and CEO Zeeshan Kingshuk Huq received the award from Guangzhou Province Economic & Information Commission deputy director Shen Zhixiong and APICTA Awards chief judge professor Gansen Zhao, said the release. The APICTA Awards is an international awards programme organised by Asia Pacific ICT Alliance which is designed to stimulate ICT innovation and creativity and promote ventures via benchmarking to venture capitalists and investors, the release also said. This year was the 18th of this Awards, a total of 17 countries participated including Australia, Bangladesh, Brunei, China, Hong Kong, Indonesia, Malaysia, Myanmar, Pakistan, Singapore, Sri Lanka, Thailand and Vietnam. Sindabad.com is an e-commerce that offers anything and everything for regular business purchases to offices, factories and SMEs through its online shop. Buyers can purchase office essentials in unified wholesale prices and get the items delivered right at their premises, the release said. According to the release, in just 2 years, sindabad.com has served more than 400 institutions and 500 SMEs. A venture of Ananta Group, sindabad.com already raised venture financing in their ‘series A round’ from the Frontier Fund, a European private equity fund less than a year back, the release said.